When I was looking over the bibliography of Respectable and Disreputable: Leisure Time in Antebellum Montgomery for one last time before the book went to the printer, it occurred to me that there are a respectable number of books about Montgomery. Although there is no definitive history of the city, Mary Ann Neeley’s The Works of Matthew Blue, Montgomery’s First Historian fulfills this role for the city’s early history. Scores of more specialized books fill in the intervening years up to the present. Personally, I’ve use many of these books in writing more than 250 newspaper articles on local history. So I was inspired to compile a list of books on the city and its environs with the hope that others may find local history more accessible. I forwarded the list to the main Montgomery County Library and to NewSouth Books. The latter, of course, has made this list available on its website. I am grateful to NewSouth Books for having done so and assume that others who want to appreciate and understand the city will also be grateful. View the “Selected Books About Montgomery, Alabama” reading list on the NewSouth website. 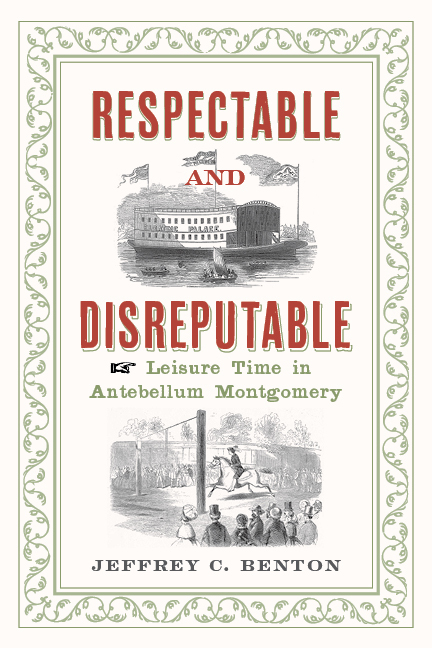 Jeff Benton’s latest book, Respectable and Disreputable: Leisure Time in Antebellum Montgomery, Alabama, is available now. Jeff Benton, known for his “Montgomery Portraits” features in the Montgomery Advertiser, has written another; this time, it’s a portrait of how antebellum Montgomerians spent their leisure time. Benton’s new book is Respectable and Disreputable: Leisure Time in Antebellum Montgomery, available now. Benton is also the subject himself of a recent feature in the Advertiser. Though “leisure time” is often a foreign concept in the modern world, the antebellum Montgomerians faced a real cultural shift in determining how to spend their time now that rising prosperity meant they no longer always had to work for food, writes Allison Griffin in the feature on Benton and his book in the Advertiser, “Lives of Leisure.” The antebellum Montgomerians considered not only how to spend their time, but also what activities were “respectable” for the burgeoning middle class. Benton tells Griffin that this new middle class were “work-oriented, moral, and very interested in respectability.” While they might often emulate the activities of the upper class, there were certain forms of entertainment, like dancing, that the upper class enjoyed and the middle class eschewed. The middle class’s struggle to determine how to spend their leisure time was in fact a struggle to decide how to define themselves. Read more about Jeff Benton and Respectable and Disreputable from the Montgomery Advertiser. at the Capitol Book and News bookstore, October 22, 2013. Jeff Benton’s exploration of antebellum Montgomery follows his previous three books about Montgomery and Alabama. He is a retired Air Force colonel who has taught history and English at the University of Maryland Far East Division, The Citadel, the Air War College, and across Alabama. 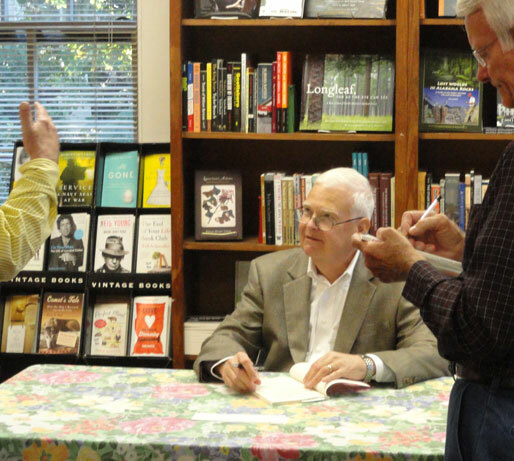 Benton edits local history titles for NewSouth Books. Respectable and Disreputable is available from NewSouth Books, Amazon, or your favorite bookstore. You are currently browsing the NewSouth Books weblog archives for October, 2013.